WASHINGTON (AP) — Democrat Doug Jones of Alabama was sworn into office Wednesday, shrinking the Senate’s Republican majority and leading lawmakers of both parties to plead for more bipartisanship as Congress tackles pressing issues in advance of the 2018 midterm elections. 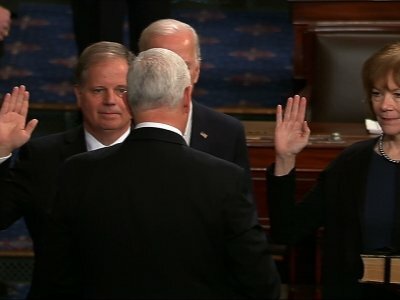 Vice President Mike Pence administered the Senate’s oath of office to Jones, the first Alabama Democrat elected to the Senate in a quarter century, and to former Minnesota Lt. Gov. Tina Smith, who was appointed to replace Sen. Al Franken, who resigned amid allegations of sexual misconduct. Two former vice presidents, both Democrats, were there to support the Senate’s newest members as the GOP majority narrowed to 51-49. In future party-line votes, Republicans cannot afford more than one defection. Jones was escorted to the Senate chamber by former Vice President Joseph Biden, who had headlined Jones’ campaign kickoff rally. Jones defeated Republican Roy Moore in a special election rocked by allegations of sexual misconduct against Moore. Former Vice President Walter Mondale, along with Sen. Amy Klobuchar, D-Minn., escorted Smith to the Senate floor. She becomes the 22nd woman currently serving in the Senate, a record. Mondale recalled that he “went through something like this in the good old days.” In 1964, Mondale was appointed to the United States Senate to fill the vacancy created when Hubert Humphrey was elected vice president. Democrats voiced hopes that the narrowing of the GOP majority would lead to more collaboration. Jones, 63, represents one of the most conservative states in the nation. He will be under pressure to find some areas of agreement with Republicans and has cited the funding of infrastructure improvements as one possible avenue. Jones is taking the seat once held by Attorney General Jeff Sessions, and before that the man Jones considered his mentor, the late Sen. Howell Heflin. Jones worked for Heflin as a staffer after graduating from law school in 1979. Heflin was the last Democrat to represent Alabama in the U.S. Senate. Biden attended an afternoon reception for Jones. “You’ve not only done Alabama a favor, you’ve done the country a favor,” Biden said. Smith is known largely as a liberal Democrat who has maintained connections to the state’s politically powerful business community. Smith called her swearing-in ceremony “invigorating.” She is angling for a spot on the Senate’s Agriculture Committee ahead of an expected push for a new farm bill this year and eager to vote to reauthorize the Children’s Health Insurance Program, for which funding lapsed last year. “It is not anything that I planned for. I am not a person who has spent a lot of time planning about what office I want to run for,” said Smith, who is running to maintain the Senate seat in a November special election. Associated Press writers Marcy Gordon, Andrew Taylor, Alan Fram and Kyle Potter contributed to this report. Chandler reported from Montgomery, Ala.